The optician prescription might seem a bit complicated, but it's actually quite simple! Eyeglass prescriptions may differ in format depending on your optician and country. Though, an eyeglass prescritopn is more or less universal, as opticians worldwide use the same procedures when writing a prescription. Below you will find an example of a common standard prescription. The prescription is divided into right (OD) and left (OS) eye. The next line indicates the various prescription terms. Your power, plus (+) or minus (-). Indicates the amount of astigmatism.. Indicates the location of astigmatism. Reading addition for close-range vision. 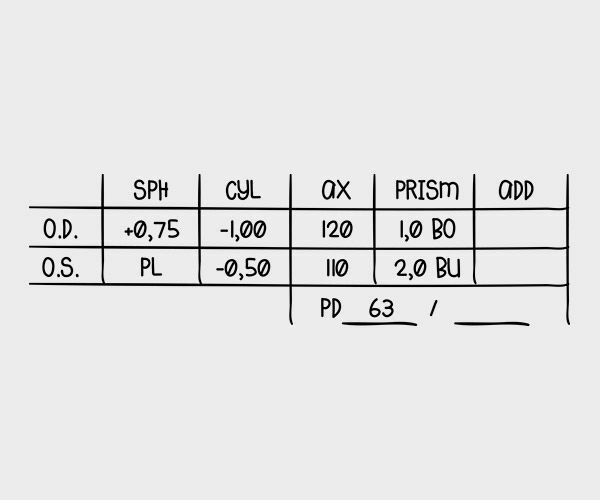 Standard vertical prescription layout, with one column for the right eye and one for the left eye. The first column from the left always refers to the right eye. 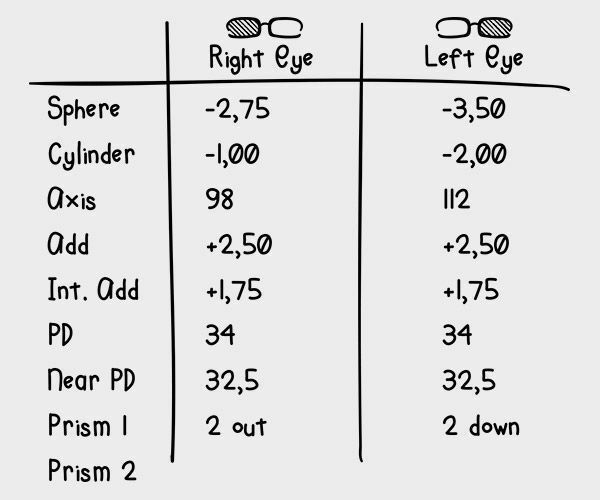 Standard horizontal prescription layout, with one row for the right eye and one for the left eye. The top row always refers to the right eye. Horizontal prescription layout, using symbols for the different values. See the explanations for each of these values above, or the full explanation at the bottom of the page. Is the measure for astigmatism. There is always a plus (+) or minus (-) sign present. There may not be a value of cylinder in your prescription. Will only appear if there is a value for cylinder (CYL), as it relates to the cylindrical lens and denotes a reference point that indicates the direction of the power of the cylindrical lens. It will be a number between 1 and 180. Is short for Reading Addition (Sometimes referred to as SEG POWER as well)- It is additional plus power in the lower portion of a multifocal lens (progressive or bifocal) that is required for near vision. Is a measurement used to accurately center the lenses in the frame that you have selected. PD is the distance from the center of the pupil (black circle) in one eye to the center of the pupil in the other eye. 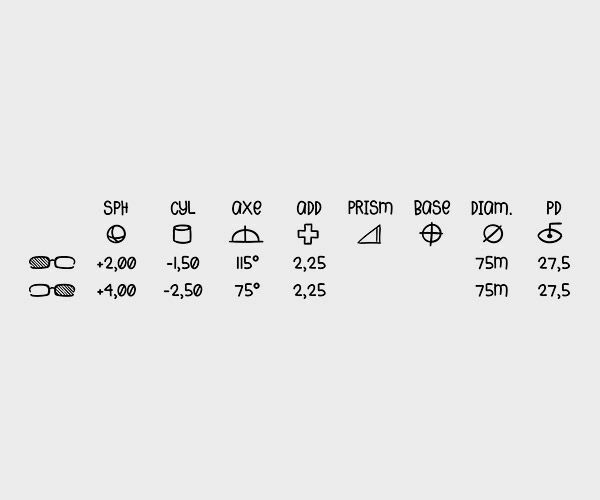 The PD is an essential measurement, and may be written with the Pupillary Distance listed for each eye respectively, for example RE: 31,5 LE: 31,5, or as one measurement PD: 63. Either way you may choose from our dropdown list your PD according to your prescription. Not relevant for making the glasses! Visual acuity describes the acuteness or “sharpness” of vision; that is the ability to perceive small details. Example: you need an acuity of 0.5 in order to get a drivers license, which means you should be able to read signs from 20 meters away. In case you have values in this field you need to contact us before you order. 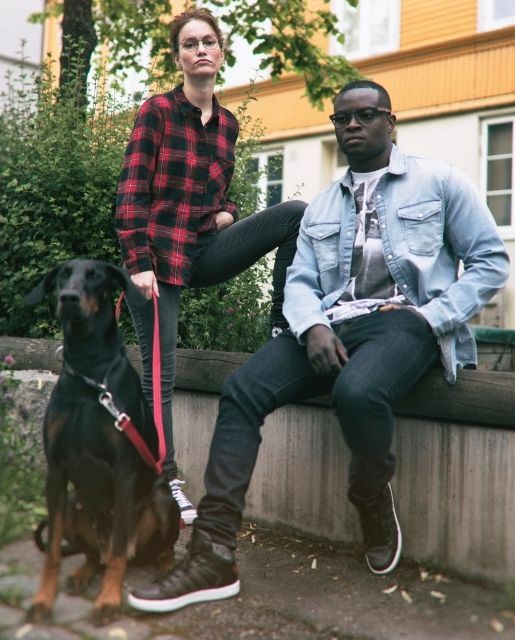 Specifies any vision displacement, like double vision. In case you have values in this field you need to contact us before you order. Specifies in what direction the prism is to be set.